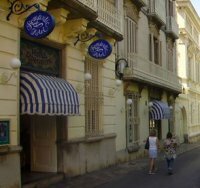 UK Gay Travel Guide - Gay Guide to Sitges, Spain. Overview of gay Sitges, bars and gay friendly accommodation. Calipolis is located in central Sitges, just 50 metres from the beach. It offers a 24-hour reception, an outdoor pool, gym and air-conditioned rooms with free Wi-Fi. The elegant rooms at the Calipolis feature a flat-screen TV and a private bathroom with a hairdryer. Free pool towels are provided. The hotel's Agora Restaurant offers Mediterranean cuisine next to the pool. There is also a bar and summer terrace with views of the sea and promenade. You can rent bikes at reception. 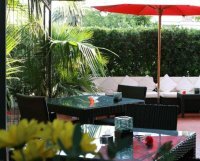 "Gay friendly"
The Los Globos Hotel Sitges, a charming hotel which is open the whole year round, permit you to enjoy Sitges and Barcelona. 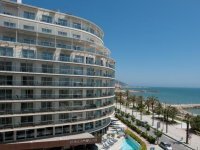 Ideally located in the heart of a calm residential neighbourhood of Sitges, right next to the beaches and the ocean breeze, and just a 300 meters walk away from the animated center of Sitges, the hotel can be reached by strolling on the maritime promenade. The Los Globos Hotel, Andre and Philippe and its staff welcome you and wants you to feel like if you are at home. This is the hotel's philosophy, aiming for a privileged ambiance for its clients. 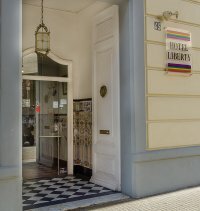 "Gay friendy"
Set in a 19th-century Cuban-style building with a charming garden, Hotel Liberty is just 100 metres from Sitges Train Station. The Hotel Romàntic occupies three adjacent nineteenth-century villas, conserved and restored in the style of the period. Collections of painting, ceramics and sculpture (in the gardens) make the Hotel Romàntic a living work of art. Enjoy its elegant interiors and the international bar. Breakfast is served in the indoor dining rooms or in the garden, among the mulberries, palms, and vines. The dining garden is one of the most delightful corners in Sitges: the water-music of its fountains will complement the finest wines of your selection. Many of the rooms have a terrace overlooking the gardens. The Hotel Romàntic offers complete bar service and wine cellar (the champagne cave is truly something to see). The Romàntic is ideally located on a street with ready access to transportation, shops and entertainment. The beach is a short walk away. One huge week of parties, performance and shows, Sitges Gay Pride 2014 runs from 12th - 16th June 2104 with the main parade on Sunday June 15th @ 5pm. This looks as if it is going to be great fun. See website for full list of contact details. Subur's Sports Bar offers full meals, snacks and drinks, and shows live football and Formula 1. Specials include New York-style steaks, BBQ ribs, nachos and burgers. Sitges's old town is famous for its cobbled streets and colourful buildings. A range of bars and restaurants can be found around the hotel, and Sitges Train Station is only 650 metres away.